Our sickness tally this month has risen. I finally caught the illness the boys had, and then we went on a trip with sniffly friends, and Alrik succumbed, again. The good news is that having a minor cold doesn't have to mean being miserable. I'm pleased to be writing a three-part series on the topic of sick days and kids for Children's Mucinex. 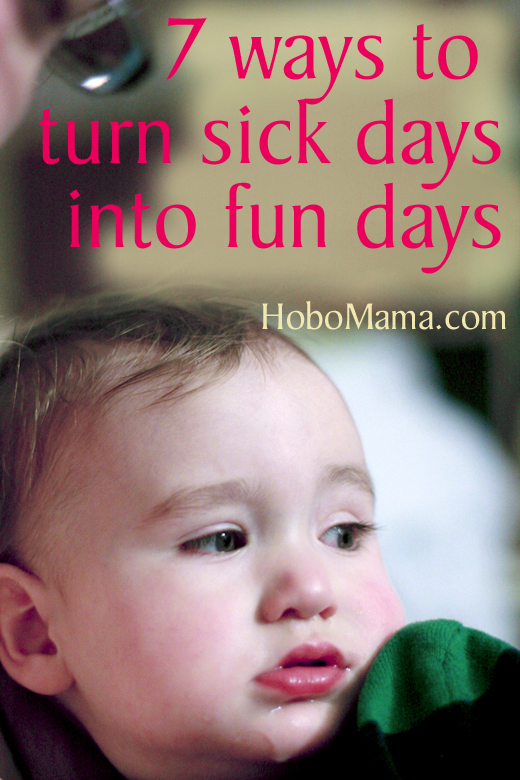 My first post offered my go-to tips for helping your family survive cold and flu season, and this post and my next one will share some of the fun home activities we've indulged in while under self-imposed quarantine. The bonus to these activities? They make the kids feel better, too! 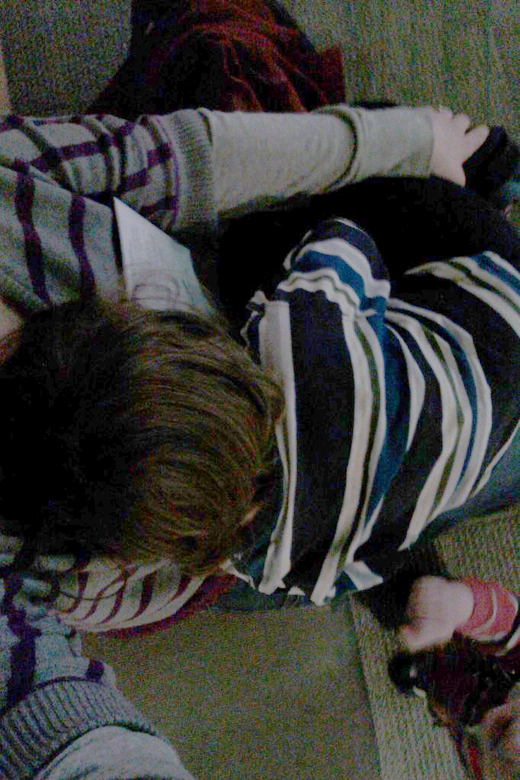 I have to admit, I eat up all the cuddling I get in when the kids are sick. There's nothing like a loving parent's lap and a gentle hug to make little ones feel secure and comforted — and it boosts my serotonin, too! Mikko's not always the cuddly sort, but during his recent bouts of illness, he would willingly crawl into my lap and even (gasp!) hold hands as we walked outside (something he wouldn't do even as a baby). On an ill-advised outing before the kids were well, Mikko climbed into my lap at the aquarium, all the limbs and heft of his five-year-old self curled into a little ball. We gave up on the aquarium and went to a restaurant. 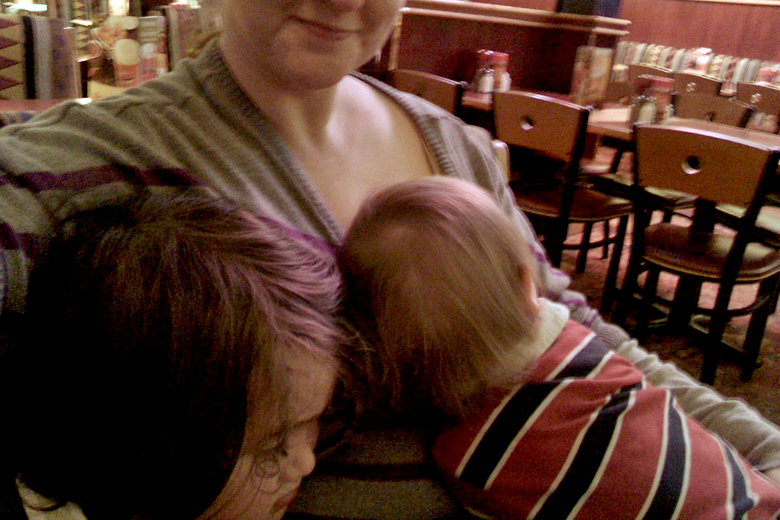 Only I ate — both boys just leaned against me (hard to wield utensils, but I tried…), and Alrik nursed. I love that the word "nursing" has a double meaning that's perfectly suited to seeing little ones through a minor illness: comforting supply of fluids along with Mama's antibodies! That's one sad baby, but at least he feels comfortable and loved! 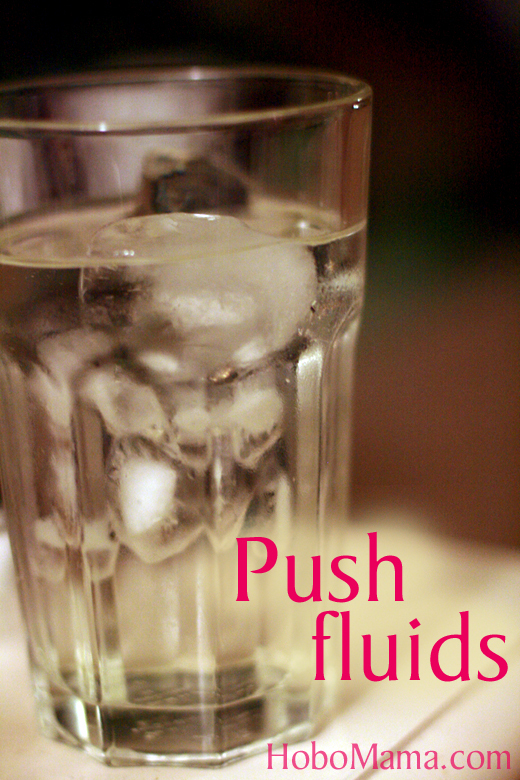 During an illness, kids need readily offered fluids, all day long. 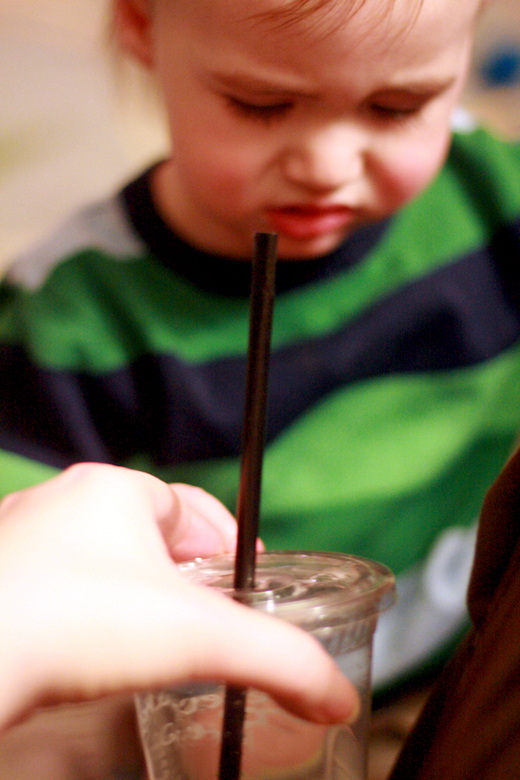 Keep suggesting they take even a sip. For Mikko, we made sure he had a steady supply of cold water and diluted juice. We also offered popsicles as a treat. You can easily make your own by freezing juice or yogurt in little cups with spoons stuck into the tops. 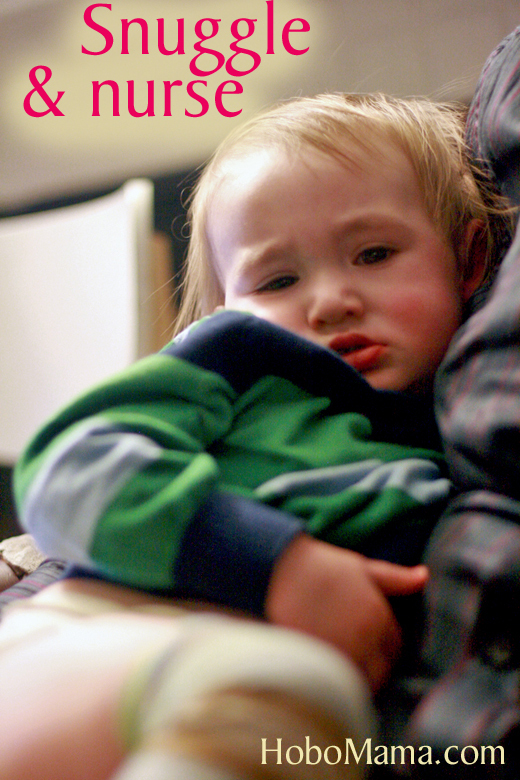 Kids who are sick need their rest — but they don't necessarily want to feel sequestered all day. The simple solution? Move their nap space to the family room. This is a great time to teach other kids who are feeling better about compassion and keeping voices low to help out the ailing sibling. But kids who feel crummy enough won't even notice the commotion! I also highly recommend snuggling with a cat and a matching quilt. Couldn't hurt. Sick days can be good days to relax rules on screen time, if you're open to that — but that doesn't mean kids have to engage with screens alone. I recommend family movie time, which gives an opportunity for more snuggles as well as calming and entertaining the members of the family who are feeling far too well and cooped up. We also greatly enjoy playing kid video games along with Mikko. He's really good at them, and it gives him a lot of practice in reading, motor skills, and problem solving while being a fun way for us to work on something together. 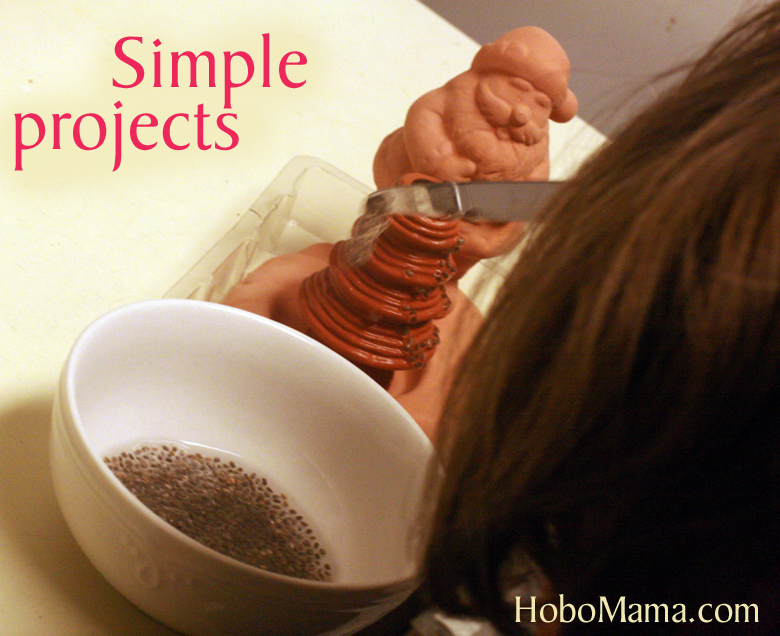 As homeschoolers, we're always gathering little projects to do with the kids. Sick days are a great time to break out the easier ones. 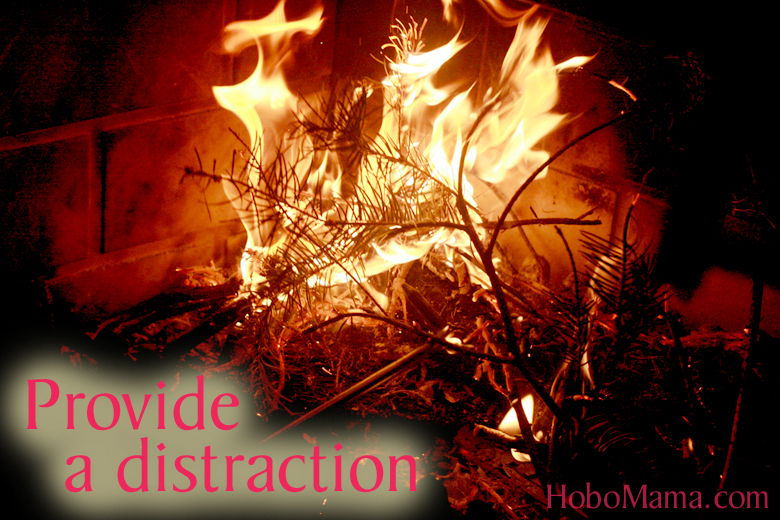 Check out Pinterest for more ideas than you could ever fit into a quarantine, or see what's already around your house. Low-key art projects, planting a few seeds, experimenting with ice, trying out a sensory bin, reading a stack of library books, writing letters to family members … anything that will distract your kids from their runny noses but still allow for plenty of resting as needed. For kids who are stuffy and feverish, the bath is a miracle worker. The warm, moist air unclogs and soothes, while the water can help regulate temperature. 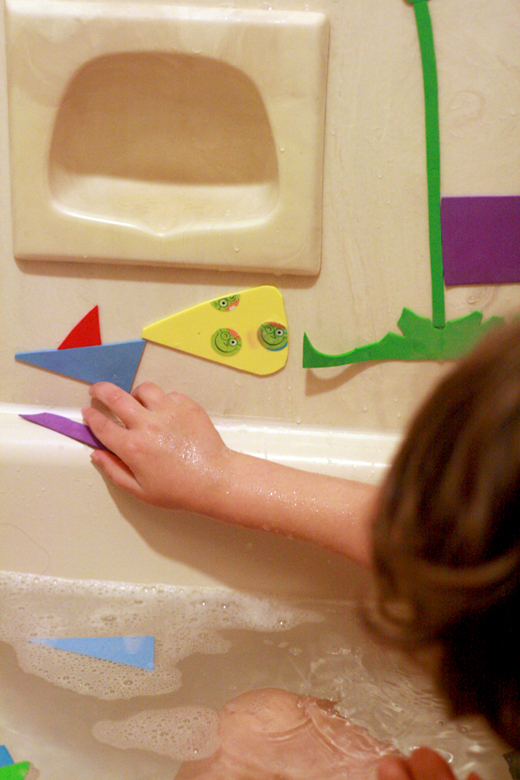 Keep your kids in the tub longer or entice them to return by providing simple, free-form bath projects. We purchased some foam shapes that stick to wet walls, but I was enamored when I found out cutting art foam into a variety of shapes is just as easy, just as effective, a whole lot cheaper (especially if you're reusing foam, as I was), and a lot more imagination-inspiring for the kids. You can find art foam at any craft store, or at many discount stores and frequently in kid art kits. They cut easily with scissors. 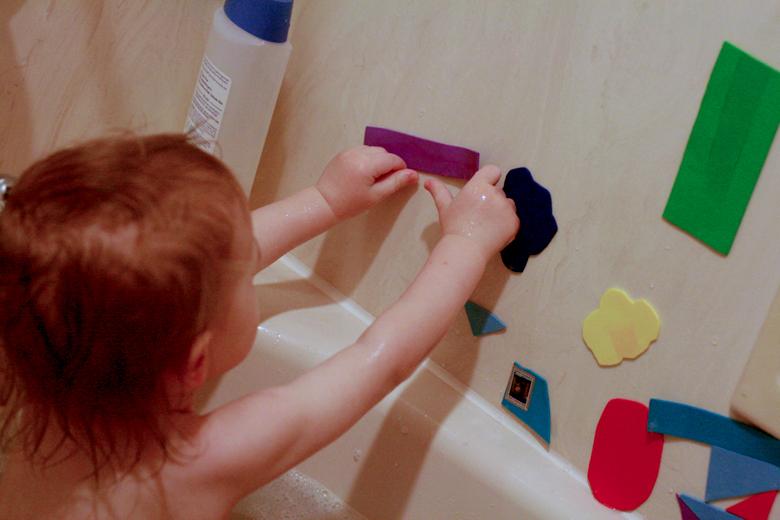 The foam shapes stick to the walls when damp and peel off with no fuss when dry. (Some of the bolder colors might leave a temporary stain, but I find that washes off. Test if you have a finicky shower surface.) The foam shapes also float on the water, so you can skim them off before draining the tub. Store them in a mesh bag for the next bathtime. I cut a variety of geometric shapes in different colors and sizes, as well as more landscape-specific shapes (flowers, grass, stems, leaves, clouds). Depending on your scissors skill level (mine is very low), you could cut out vehicles, animals, houses, and the like — but be prepared (and excited) for your kids to use them in unanticipated ways. Foam shapes also make a great activity bag or gift idea to offer another family, particularly if any of the kids there are sick! Other ideas for fun bathtimes include bubbles, changing the bath color, an assortment of bottles and containers to pour, several sponges and washcloths with directions to clean the tub or various body parts, and non-bath but waterproof toys (or kitchen utensils!) for a change of pace from the usual bath toys. You can also hop into the bath with your kid and play along! We decided it was high time to put our Christmas tree to good use. Sam had chopped it up and stored it with our firewood, so we pulled half of it out to burn. I realize this is an odd one to recommend, but I think any out-of-the-ordinary activity can turn a sick day into a fun-with-mom-and-dad day. Mikko loves it when we use the fireplace, and we rarely do. When better to give it some action than when both our boys needed some cheering up? Burning a Christmas tree (pop! flare! pine scent!) was just the ticket. As an eighth way to turn sick days into fun days, I support the appropriate use of over-the-counter medicine when my family members need it. 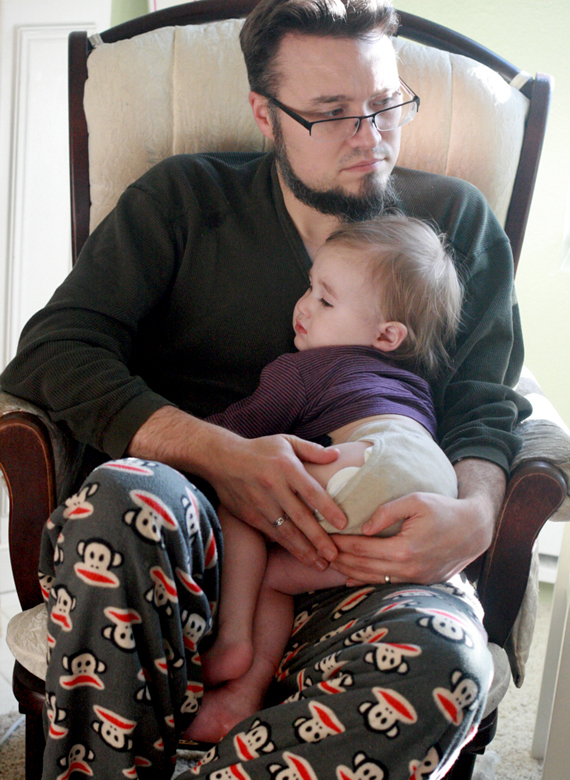 We don't use medications often, even during an illness, but I like to know there are child-specific options available when cold or flu symptoms are keeping my children from sleep or making them just way too miserable. I'm glad that Children's Mucinex is one of those medicines, relieving symptoms of congestion and coughing due to colds and flu, and letting Mikko continue his active day and get restful sleep at night to support his immune system's hard work. 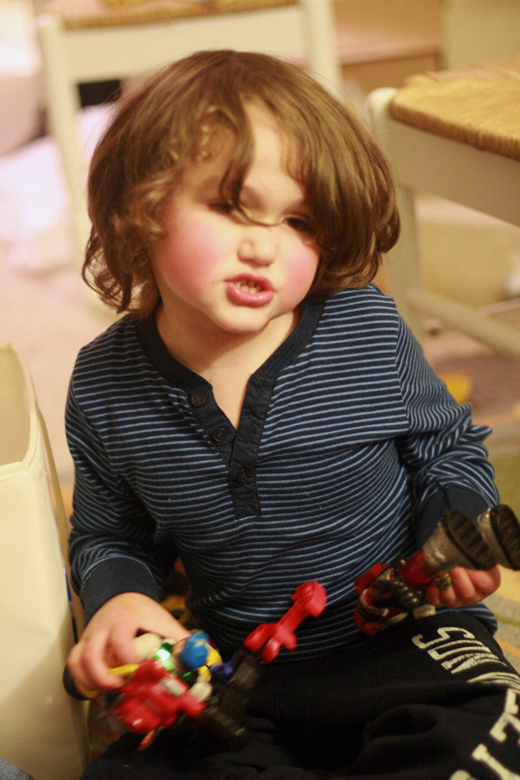 Before long, Mikko was back to his old self — playing, talking a mile a minute, and rosy-cheeked with fun instead of a fever! Always use Children's Mucinex Multi-Symptom Cold as directed, which means following all the warnings and information on the product, not using any more than directed, and using only for children 4-12 years old. If you are unsure about using Children's Mucinex Multi-Symptom Cold, please consult your pediatrician. And now, you can get a coupon for $2 off your next purchase of Children's Mucinex Multi-Symptom Cold on Coupon.com! Please come back for one more post in the series with a fun and simple craft project that will put a smile on your kids' faces even if they're sick! I'm also very excited to give away a $100 CVS gift card on each post, so leave a simple comment to enter to win! Comment below with an answer to this question to enter the giveaway: What activity makes your child smile when under the weather? Please leave a valid email address in your comment so I can contact you if you win! You may receive 1 total entry by leaving a comment in response to the sweepstakes prompt on this post. This giveaway is open to US Residents age 18 or older. Winners will be selected via random draw, and will be notified by e-mail. You have 72 hours to get back to me; otherwise a new winner will be selected. Be sure to visit the Children's Mucinex Multi-Symptom Cold page on BlogHer.com where you can read other bloggers’ reviews and find more chances to win! My kids like to color together or work on word searches or mazes when they are not feeling well. My daughter loves doing puzzles! A banana milkshake does the trick! Usually, we'll put a bunch of pillows on our couch with a special blanket that the kids use only if they are sick and they'll pick out their favorite movies to watch. 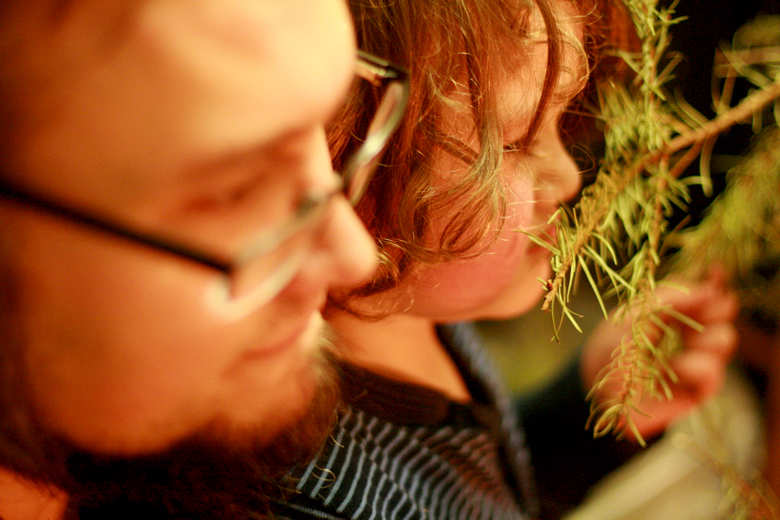 When we spend time reading together, or doing any other craft projects at home, and television, they always feel better. TV- we watch way too much TV when either of the kiddos is sick! Boo! My daughter just loves being held by her mommy. Lots and lots of snuggling, holding and hugging. Having grandmama read to them helps. The only way to get my son to smile when he is sick is to call my mom, who he calls Gei, and have her come over and give meds, cuddle, and watch movies and read to him. They love coloring or watching cartoons. When any of my kids are home sick they truly love that one on one time snuggling with me and watching a movie and they love that all my attention is mainly on them. Thank you! He likes to play Super Nintendo games when he is sick. Mine love that extra special attention from Mommy. 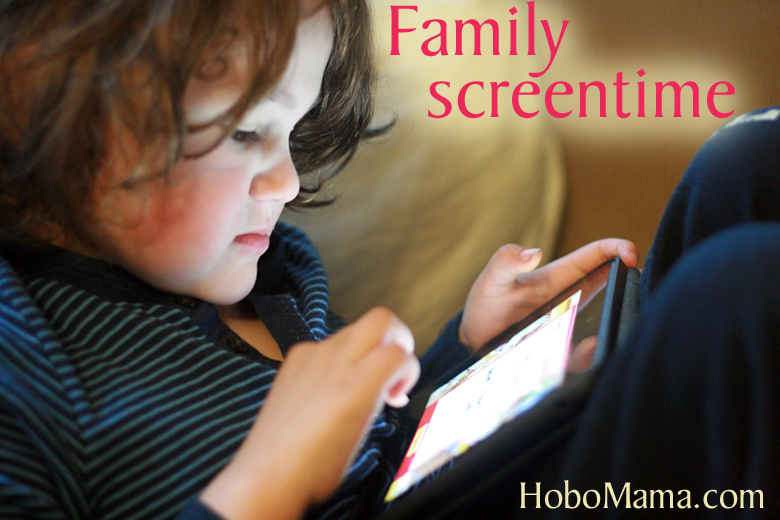 My kids just like to stay in bed and watch their favorite cartoons or play on the ipad. Snuggling and watching favorite DVDs. Well, I don't have any kids myself, but the kids I work with like to watch movies and eat popsicles or ice cream! popsicles, movies, building a fort and lots of cuddling! my daughter likes to read books and play with puppets.thanks for the giveaway! I loved those foam bath toys when I was younger. 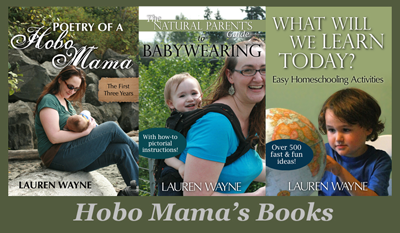 I can't wait to share them with my kids! Loves to play games such as go fish or finger paint! My kids love to snuggle up on the couch and watching a movie together. When my kids feel their worst the only thing they want to do is lie around and watch their favorite videos. Reading together is always a way we can relax when one of us is sick! Oh Carter always loves when I read books to him when he is not feeling well! Always his favorite! My baby is little and will smile at herself in the mirror no matter how badly she feels. Sometimes when kids are sick they don't want anything so it's better that they eat icecream than not eat anything you know? When I'm watching my nieces, and they are sick, house rule is that when you're sick you can eat *anything* you want as long as you eat something. Just like your foam shapes for the bath, I've found that bath paints are a great distraction from a sick day at home! Reading books with me (or listening to me read)! Thanks for a chance to win and have a great day! We don't have children yet but when I was young I remember loving to help out my mom in the kitchen when I stayed home. A project would be something fun, I would think. Watching movies makes them feel better. My son loves playing with his LEGOs. I watch my granddaughter when she is sick and her Mom works. I try different things but last time I gave her (7 years old) a warm foot bath with soak in a small basin and rubbed her feet with warmed lotion, put on socks and then we snuggled and talked about everything under the sun! Her Mom told me she loved the foot bath! My daughter loves to watch The Parent Trap in her room over and over again when she feels crummy. She knows the words by heart. My son loves to play a game on my iPad when he's sick. My daughter loves to build a tent on the couch where she can see the TV and pile all of her stuffed animals in there with her. When my daughter was young, we would watch her favorite movie and then play board games. Reading a book keeps her happy. I don't have kids, but watching Disney movies always cheered me up when I was sick as a kid. My daughter likes to do simple crafts when she doesn't feel well. Using felt is one of her favorites. My son loves to cuddle with me and his favorite blanket while watching his favorite movies when he is feeling under the weather. My kids enjoyed listening to stories that I read to them when they were sick. My boy loves to watch The Wizard of Oz, over and over again! Watching funny you tube videos makes my son smile when he isn't feeling well. When my kids were sick, it was hard for them to focus on craft projects. but they always loved to read, and it would make them smile to snuggle up under a warm blanket and I would read them their old fave books. My daughter loves to paint and do puzzles when she's not feeling well. Eating my homemade chicken soup and reading him a story. My kids like to watch cartoons. Television makes my children smile when they are under the weather. Just letting my grandson lay on his Nano( yes, that's NanO) and holding him seems to make him feel better. We also watch Dumbo and Sesame Street all day. My son adores snuggles, Caillou & popsicles. Snuggling with mommy makes them the happiest. When my kids are sick I can always make them smile by cuddling with them on the couch and watching americas funniest child videos! No matter how sick, my little 8 mo. old grandson will smile when Nana dances to his video songs.....Barney songs, Sesame Street are his favorites for Nana to dance to! Then a big kiss and hug and cuddling on the couch with his "binks" and a warm bottle! Sorry did not leave my email in the comment! Definitely snuggling, but he's still pretty little. Tristan likes me to lightly rub his back. Being read to. My daughter is learning to read to us, but when she's sick she still wants the books, but without all of the effort of reading. She still participates, just not as the reader. We usually put in movies since they normally don’t get to watch them. Leaving TV and movies for special times only makes it so they really enjoy watching it when the opportunity comes along. PLAYDOUGH!!! It works every time! If she doesn't have a headache, my daughter enjoys reading when she is sick. If she does have a headache, I will sit and read one of her books to her. I'll duct tape a large piece of paper on the wall and let them color on the wall JUST THIS ONCE. they go wild!! Just hugging them and letting them know I am here...and maybe chicken noodle soup..
We just stay in and read books, play games etc. Drawing makes my kids smile when they are under the weather. They love to paint something colorful to cheer up. We snuggle on the couch with pillows, blankets, and a favorite movie. Kisses & cuddles make my "child" smile when under the weather. Playing with puzzles and other games and then having someone read to them while drinking hot chocolate or having a glass of root beer. Getting plenty of cuddle time with mom makes my daughter smile. I like snuggling with my little cousin when she's sick too, she's rarely in a snuggle mood otherwise. We make storybooks or watch a show, she always recovers quickly thankfully. Building a fort to keep the bad germs out! fresh made cookies and a good book read by Mommy! They smile when we have battle of the books-who can read the most pages in their book. We put together a puzzle or do a watercolor painting! We cuddle up on the couch with her favorite blankie and watch Finding Nemo...she loves that movie! I used to love to just sit in bed and play with my Barbies and He-Man toys when I was sick because it took very little energy. My daughter loves to snuggle on the couch, watch DVD's and draw/color. Snuggles and sherbet ice cream always does the trick. Making a fort out of the couch or bed to rest in -always more fun to sleep in a tent. WOw that is just such a cute idea.. love it. we normally watch tv, eat soup and drink clear liquids. We make a pillow fort on the living room floor and watch movies. I like to shop at the dollar store for small things that make kids happy. Surprises make life fun. My girl watches the wizard of oz when she is sick. My boys like to cuddle and watch movies when they are sick. A warm bath & Hot Chicken Noodle Soup. Lots of chicken soup and tv in bed. My daughter likes to glue together a collage. We keep a box of fun little cut out papers, buttons, etc. on hand. watching tv in bed & coloring books/sticker books! They like to color or watch movies! My kids like to watch movies and eat popsicles. Making something out of Play-Doh will usually make them happy, even if not feeling well. Favorite treats, toys and movies. We play iPad games together. Watching a funny movie together. My daughter loves to cuddle and read books. Drawing comic strips and watching DVDs. I would make a "nest" on the sofa and watch our favorite movies. watching movies and peanut butter and marshmallows sandwiches. my kids love to watch videos when they are under the weather! Thanks for a super giveaway!